"Memory Prints," showing through Jan. 24 at Pho Pa Gallery, blends time and space. The title of Damir Porobic’s exhibition at Pho Pa Gallery, “Memory Prints,” opens an ocean-vast door. While memory is a rich topic for photography, it’s a tricky one, loaded with pratfalls and pretension. Porobic’s foray into the subject, however, is a rare treat. The photographs themselves, including three successful series, are interesting enough. The first series is easy to grasp out of the gate: layer on layer of images of the same subject are piled onto each other, with a very soft touch. The second is much more abstract and delves into systems and the external logic of framing and presentation. The final group is brilliant and impressively original, relating photographs of photographs to each other as separate elements, both challenging viewers and richly rewarding their time. In his show statement, Porobic leans on artist and writer Victor Burgin’s statement that a photograph is “an offer you can’t refuse” to make the point that the viewer of a photographer is “seldom asked to be a critical reader.” Frankly, I couldn’t disagree more strongly with that point. Judging by his work, I think Porobic agrees with me. Newspapers rely on photographs as sources of information that are subject to standards. Movies and novels constantly lead their detective protagonists to study images no less than NASA scientists do. Christopher Brown’s famous paintings of the infamous “Zapruder film” are all about this. Porobic’s focus on memory is hardly a novel topic, but he makes the clearest distinction between the memory processes of painting and photography that I can recall. In his 2014 “Casco Flag (Memory Series),” Porobic presents a lightly printed image of a flag fluttering in the wind. Layer on layer have been placed upon each other until certain elements solidify into something like focus. And Porobic is clearly aware he is referencing a language shared by printing and psychobiology. 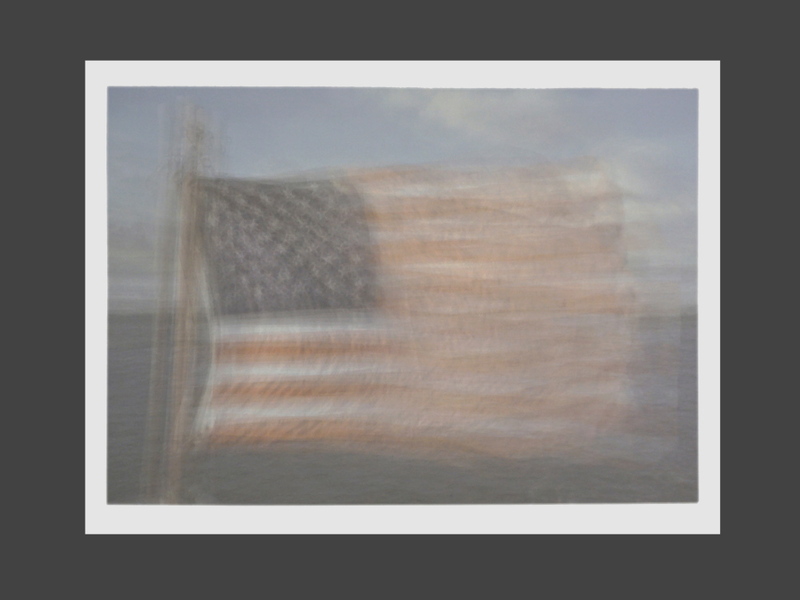 This flag image does something atypical for photography. Photos are cross-sections of time made in a definable instant. Paintings, on the other hand, are shaped by artists’ “sensibilities” (a preconscious style-like quality comprising their experiences, preferences, education, values and memory) gesture by gesture, with each responding to the previous step like a pathway. Porobic reminds us that paintings are backloaded with memory while photographs generally have little or no memory – just traces that are legible if you know how to read them critically. This offers a potential distinction between art photography and the snapshot, as well: Unlike the amateur, the photographer is an artist who brings his sensibilities to bear in his images. It is this idea of the photographer as painter that we see at work when Porobic shoots photos of white plastic chairs over and over until they come into focus with a sort of Platonic essentialism. The focal point isn’t a specific object, but this generally recognizable thing – like what Plato called a thing’s “essence.” The Greek philosopher thought this repeatable essence was truer or more real than a single instance of itself. And that is precisely Porobic’s point. What is more important (he seems to ask), this particular example or the idea of the American flag? It might seem obvious, but it’s a powerful question. The “Transforming Image” series is presented as pairs. 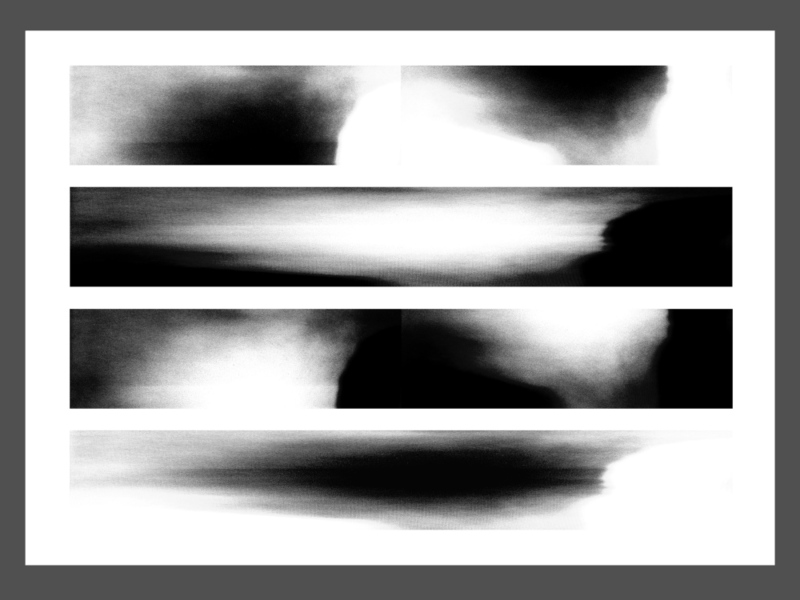 In one frame, we see four abstract black and white bands, one above the other, on a single print. Next to this we see the same four images, but each in its own frame. We come to notice there are two pairs, with each component the inverse of the other. After a bit, you may stop trying to parse the objects of the photos (which I never solved) or their textures (denim-like) and instead recognize the binary systems logic driving the work. It’s an unnerving shift I imagine is similar to the public’s first experience with abstract painting a century ago. The final works are among the best conceptual photography shown recently in Maine. The pair of “In-and-of Itself” works comprises photographs of the Chiri paper on which the photographs are printed, so they are photos printed on the photographed thing. Fittingly, “chiri” means “leftovers” in Japanese, and the paper is made mostly from the remnants, including bark and rougher bits, of kozo bush used for finer papers. We see colorful bits near their own images. The images are smaller than the support, so the effect is like looking at reflections in a double-paned glass. 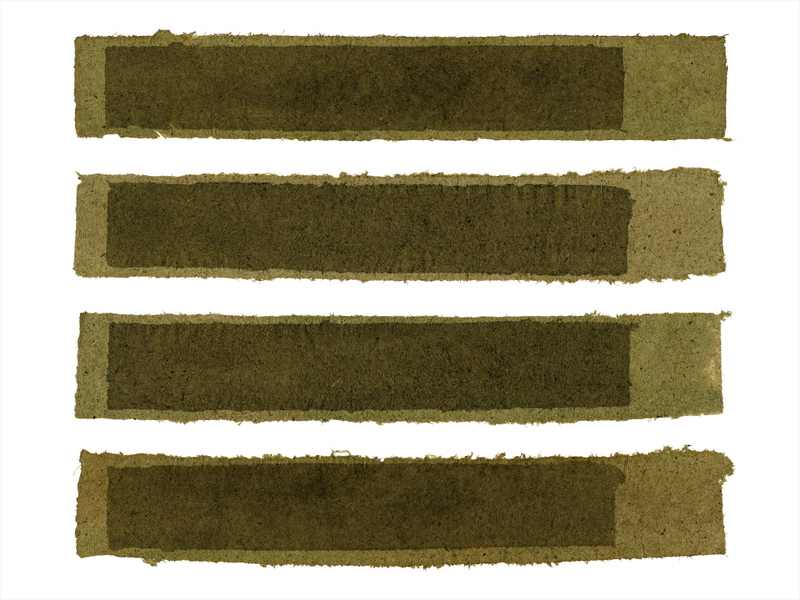 For “Return Project,” Porobic appears to have photographed bands of grass (the long, horizontal form in this show is fitting since it refers to the reading form of Western linear narrative) and then photographed the prints of those images layered with the grass itself. These prints force us to look to details in shape and edges to confirm these are images of the same thing shot in a series that includes the slightly-changing originals. These are not only interesting and visually sophisticated from a painterly design point of view, but they offer a model of memory questioning whether we are looking back and forth between a new version and the original or between the new version and another analogue. There are more implications about data, memory, traces and art (not only photography and painting, but printmaking as well) than we could possibly visit here. 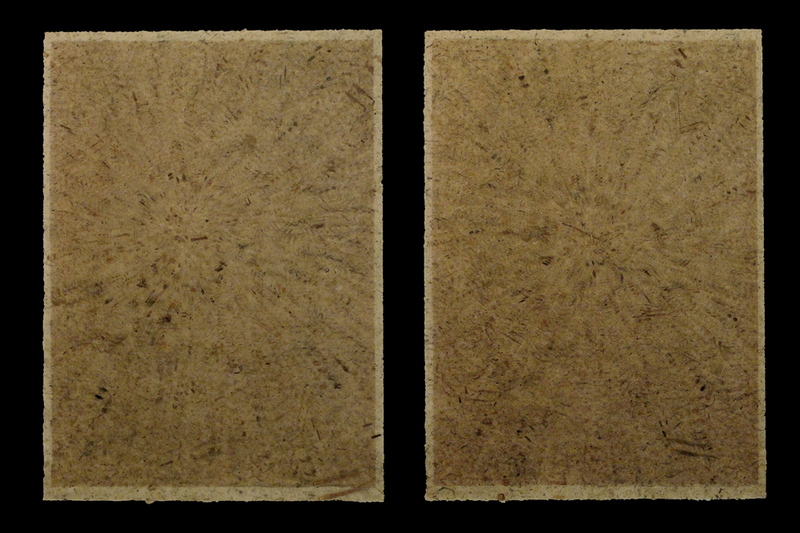 For example, when Porobic runs the same piece of paper through the printer 40 or so times, the ink builds up on the surface in a way that opens dialogue about prints, layers and things like Moiré interference patterns (The planted idea that layers of memory produce interference patterns is potentially explosive – think folie à deux.). While photography is the primary mission and expertise of Pho Pa, we’re going to see many photography shows in Maine this year because photography is the 2015 subject of the Maine Curator’s Forum. I generally have thought that group’s marketing-oriented colluding on arbitrary topics to be short-sighted and condescending, but they finally might get it right: Maine is overdue for a serious consideration of photography. I look forward to seeing whether the effort can live up to the high bar set by Porobic and Pho Pa.